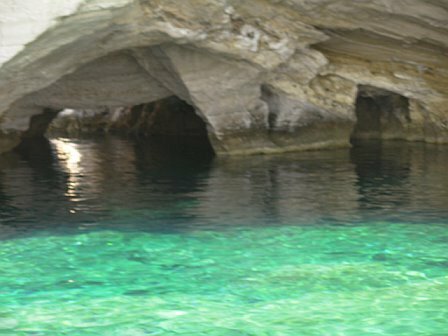 Caves off the island of Milos, Greece. When traveling to a country that uses a different alphabetic and numerical system, its a great idea to have your lodging information and important emergency information available in that language. Many countries that are tourism and hospitality oriented have a high rate of English speakers but that doesn’t guarantee they’ll be available at the exact time you need them. Be adventurous but don’t underestimate a city you’ve never visited before. It’s easy to become disoriented. Older cities and towns can be tricky to navigate presenting similar architecture for miles leaving many tourists scratching their heads. Look for apps that help with reference locations and keep a small cheat sheet handy at all times. Group travel. As fun as traveling in a large group can be, logistics can be tricky. Adding to the challenge, sometimes people have different ideas of how they want to spend their time. If thats the case, suggest a meeting time and place to regroup. Attire. Many cultures have traditions they expect us to respect when visiting their country. Conservative attire is always recommended when visiting countries some countries, at the very least before entering a religious center. Just know, that it doesn’t have to cramp your style. I like to adopt some of the local fashions whenever possible. Use your criteria, depending on your style some things may be alluring while others won’t. But there’s usually something for everyone. The most conservative country I’ve visited was Egypt, and I wore my normal close, except for tank tops and miniskirts. Cotton tops with short sleeves and linen pants, capris, or knee length skirts are perfect. So are jeans. Just remember to cover up more if visiting a mosque. Food. Probably high on my list of best parts of traveling to a new place is trying new foods. Now, every traveler has had that encounter with food poisoning and it can be ugly. I mean, being sick and away from home is a pretty miserable predicament. Anthony Bourdain hilariously refers to those dreaded toilet moments as the ‘thunder bucket’. Let me tell you, I feel him on that one. Just remember hope is never lost. For the most part these episodes pass on their own. If after 24 hours you see its not, to the clinic or hospital you go. Cash. You can customize this to your liking, but the basic principle here is don’t keep your eggs in one basket. Not only is it a good idea to have a couple separate stashes of cash. But also, to have in each stash, a mix of dollars/euros, and the country’s currency if they have one. Credit cards are helpful. Just remember to call them and let them know you’ll be traveling. Call them twice what the heck. Taking care of a seemingly simple detail will help make life easier during your trip, so its worth the extra effort to make sure it gets done. And if it still doesn’t. then there’s always a good laugh. Happy travels! I agree, but i wouldn’t call it being selfish. It’s having priorities!